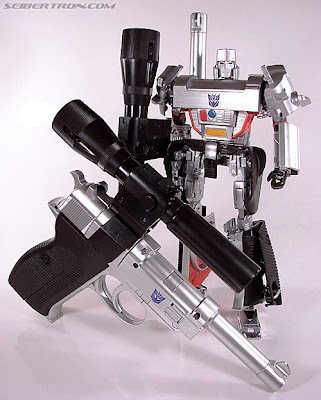 The government of Australia has banned the import of the Transformers Masterpiece Megatron collector's toy into the country (click here for the story). This is Megatron as he originally appeared when the Transformers line was first introduced in the early 1980s... but this one has a much better sculpt, is greatly articulated, is made of die-cast metal and is a lot sturdier than the '83/'84 model (how many of us cried when the original Megatron's arm came off?). He also transforms into a life-sized Walther P-38 semi-automatic pistol... which is the problem. Masterpiece Megatron is now considered a public health threat by the authorities in Sydney. Yup, 20 years ago this was a perfectly okay child's toy. In 2007, at $100 a pop and marketed primarily to adult collector's, you need permission from the Australian government before you can import one from there. So far they've impounded about 50 Masterpiece Megatrons. Just one more sign that the world we live in has gone positively bonkers. By the way, my friend Phillip Arthur has the good fortune of being the proud owner of one of these babies! Check out his in-depth review here and if you find yourself salivating for one, you might be able to luck out on eBay (I'm seeing Masterpiece Megatron currently going from $90 all the way up to almost $200). Not banned in Australia, you just have to get a form from customs outlining that it is what it is. A mere formality designed to stop the importation of weapans that is easy to get through. One form. I'm just glad we don't have to modify it in anyway. Not banned; as someone on Slashdot corrected someone else's writing about them being able to pick up anyone at any time once we're all guilty, they said "take their property" as well. So I think this may be more of a "land grab" than an actual belief in a potential public health risk.